It’s summer time. No time more perfect to make some delicious ice cream! 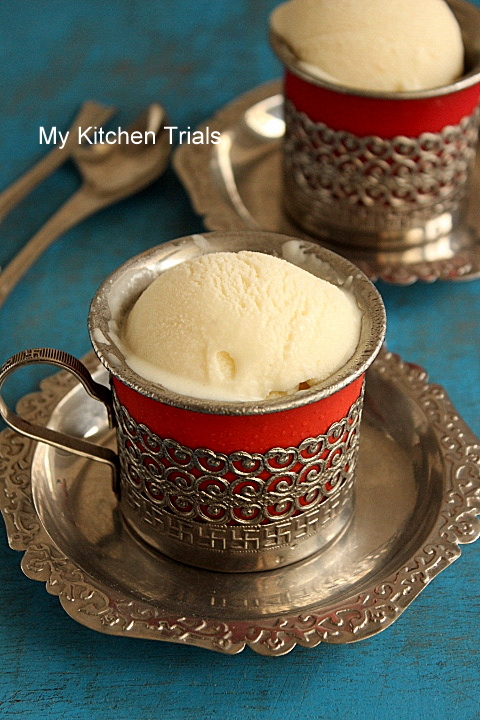 I always thought making ice cream was a time-consuming, laborious task. It wasn’t, actually. All you need to do is boil milk and sugar, along with corn flour after some point. Making ice cream was a lot easier than taking a picture of it. It was melting before I even took the camera out and that’s when it really strikes to you….it’s summer, baby! Keep aside half cup of milk. In a thick bottomed pan, pour the rest of the milk and add sugar to it. Heat it, stirring in between to dissolve the sugar. Let it simmer for 2-3 minutes in low heat. To the reserved milk, add 4 tbsp corn flour. Mix until no lumps remain and add it to the simmering milk. Stir continuously to avoid lumps. Cook it for some more time until the milk thickens and starts to coat the back of the spoon. I had to use a little less than a tablespoon of corn flour more (mixed with a little cold milk) to reach this stage. Take off the heat and let it cool. Stir in between, else you might have a ‘skin layer’ on top. Once it’s cool, stir in the fresh cream, vanilla essence and whisk until its incorporated well. I used a hand mixer for this. If you are using puréed fruit, you can mix it in now. Transfer this to a flat container with lid and freeze it until set. 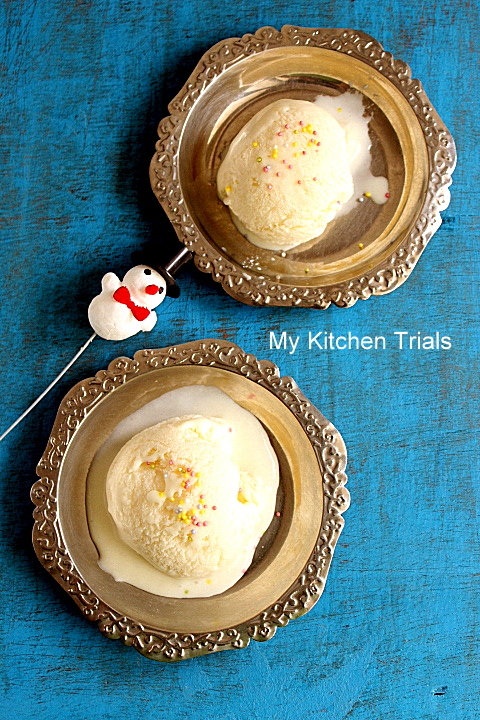 Take out and using a hand mixer or a mixie beat the ice cream mix. Freeze it again until its set. Repeat the beating (you can use hand mixer, mixie, blender or even a fork) 3-4 times. This will ensure a creamy ice cream with no ice crystals. After the last mixing using the hand mixer, you can add the crushed cookies, chocolate chips and mix using a spoon. Freeze till set. I made this at around 3PM, kept mixing it once every 2 hours and then let it freeze overnight. Scoop out in the morning and serve :-). How do you click pictures like these? Making it almost impossible to not want vanilla ice cream at the moment? Fabtastic!